At Clovr Studios, there’s nothing we love more than making apps for VR that people love playing. There are a lot of incredible Oculus VR games out there and we’re so honored to be a part of such a wonderful community. The response to our first new VR app, Apollo Slots, has been overwhelmingly positive and we would like to take just a second to thank everyone who has given it a try. If you haven’t had a chance to experience it for yourself yet, you might be wondering what makes it so special. Fortunately for you, we have the answer you’re looking for in today’s post. Keep reading to find out what you can expect to get out of your experience with Apollo Slots VR! One of the best things about apps for VR devices is that they’re so engaging. Being absorbed in a wholly unique experience is a fairly new thing and our app introduces people to an incredible world of virtual gambling. Whether you are an avid gambler or someone who is completely new to it, we think that you’ll be fully engaged with the fast-paced thrills presented in our app. Give it a try and see for yourself! If there’s one criticism that seems to be common about the best virtual games, it’s that the experience itself is too short. One of the biggest benefits of Apollo Slots VR is that it stays engaging for longer thanks to the constant thrill of winning big! The next pull of the lever could just be the one that allows you to strike it rich and having an app that allows people to explore a unique setting and play on unique machines is truly a one-of-a-kind experience. We hinted at this above, but the feedback we’re getting from people who have played Apollo Slots VR is that they just can’t get enough of it! If you are looking for something in the VR app store that keeps you coming back for more, we hope that Apollo Slots VR is what you’ll choose. We have loved every aspect of this game from the initial research to the design to actually playing it ourselves and we’re happy to say that those who try it for themselves agree that it’s one app that they return to time and time again. 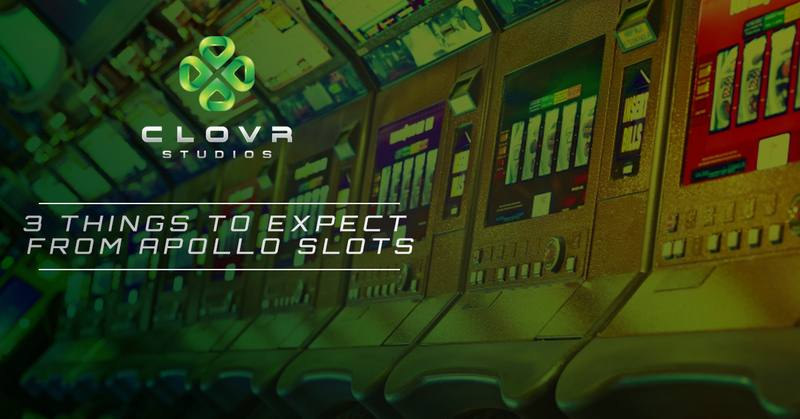 With Apollo Slots being available now and more in store for the future, you can count on seeing more of Clovr Studios in the weeks and months to come. We look forward to continuing on and making some of the best virtual games you’re likely to find anywhere. Try Apollo Slots for yourself today and keep your eyes on this space because we’ll continue to bring you news and updates so you can stay in the loop with everything that Clovr Studios is doing. Thanks for following along with us on this journey!